…..what we found surprised us – and flew in the face of perceived wisdom in the field. Achieving large scale social change is not just about building an organization then scaling it up site by site. Many of these groups are not perfectly managed. Nor are they all well marketed. And at least half don’t score well on conventional ratings, because they care more about having impact than they care about having low overhead budgets. They do what it takes to get results. 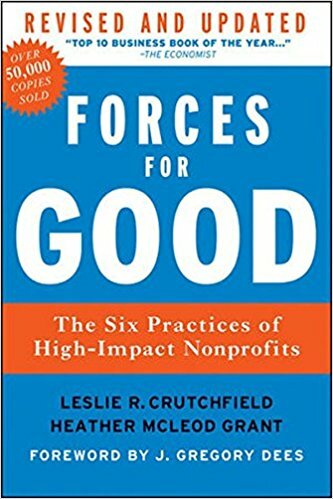 Criteria- A nonprofit founded in the US recently (1965-1994) which has achieved substantial, sustained results and created larger systems change. Changing laws is hugely powerful, so is doing grassroots work on the ground with real people. Doing both is a synergistic effect. There cannot be fear of corporations and the business, we must recognize the power of business and harness the forces of the market. Great nonprofits see other organizations as partners and allies, not competitors. They work together and build the capacity of others to create more change. Great nonprofits must respond to their environments and change their programs, organizations according to what works. Entrenched bureaucracies fail. Executives of great nonprofits know that they need to develop leaders who have the power to make the organization even better than anyone alone. Figure out what your org needs to have an impact and invest in that, even if makes look less “lean”, making sure to diversify your funding streams through foundations, donors, and government. First figure out your mission then pay great people who buy into the mission.